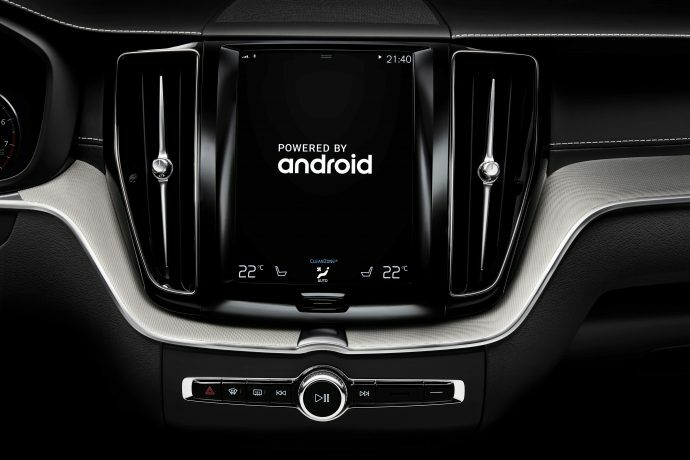 What’s New: At the Google I/O conference, Intel, Google and Volvo Cars debuted the latest Android (P) Operating System (OS) running Google applications. Powered by an Intel Atom® automotive system-on-chip (SoC), Volvo Cars demonstrated the latest in-vehicle infotainment (IVI) experiences in a prototype Volvo* XC40. Advanced features include voice recognition via Google* Assistant, access to the Android app ecosystem through Google Play Store, and the ability to use Google Maps natively in the car’s IVI system. Why It’s Important: Cars have become an extension of consumers’ digital lives, and for the past decade, cars’ cockpits have become the new battleground for automakers to stand out and provide tangible consumer value. The market for IVI is projected to grow to $33.8 billion by 2022. Today, high-definition displays offering touch-screen navigation, climate control, entertainment and mobile interconnectivity have become the new norm as more of these features become standard. What It Means: To realize the full potential of IVI, automakers needed to move away from proprietary software solutions. This required an operating system (OS) and applications that could be easily customized, updated and scaled. In 2015, Google enabled this by extending its Android OS for the IVI market. With the Intel Atom SoC as the underlying platform, the latest Android OS (P) and Google applications deliver new and exciting automotive experiences with a familiar and extensive set of resources for the developer community to build on. “We’re excited to work with Intel and Volvo to bring drivers the next generation of in-car infotainment powered by Android,” said Patrick Brady, vice president of Android Engineering at Google. 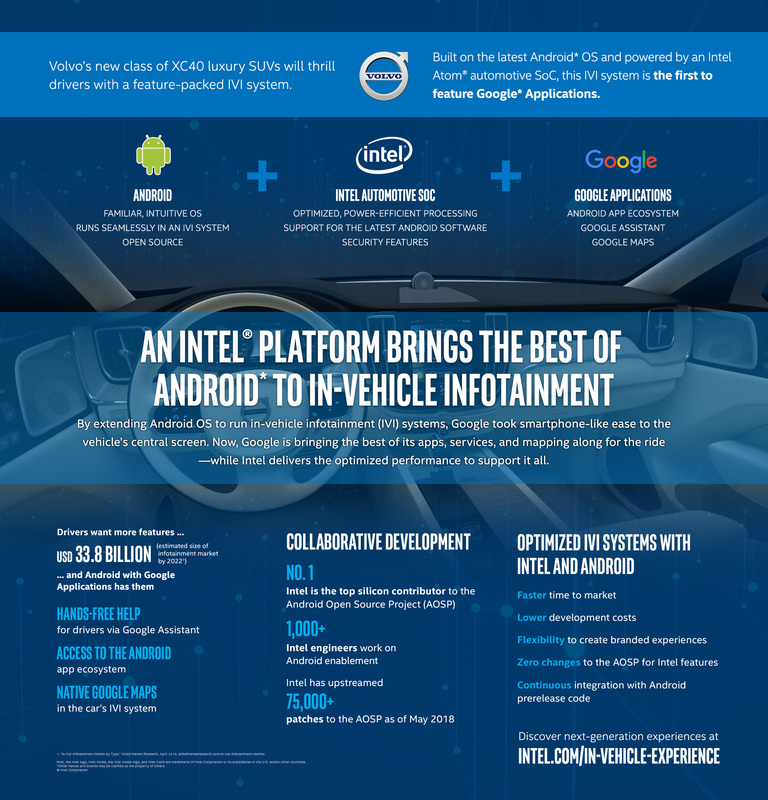 How It Works: With Android running on Intel Atom automotive SoCs, automakers get optimized processing, the latest software versions and security features. 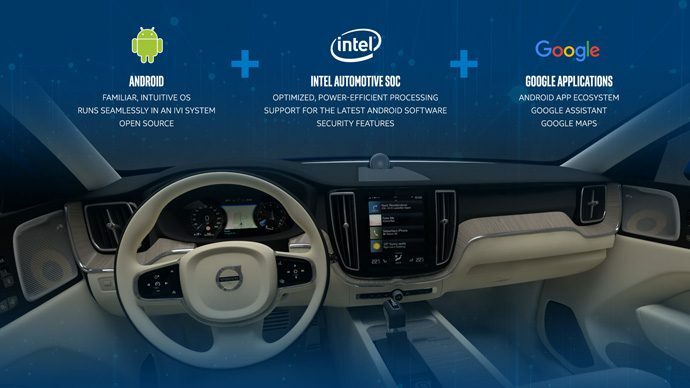 Intel’s board support package (BSP) for Android is optimized and enabled for the Intel SoC; it debuted in this commercially-available vehicle powered by Android, giving consumers access to the latest automotive Android apps like Google Maps and Google Assistant for hands-free driving assistance. For More Information: To learn more about this integration, check out the demo vehicle at Google I/O, May 8-10 at the Shoreline Amphitheatre in Mountain View, California.